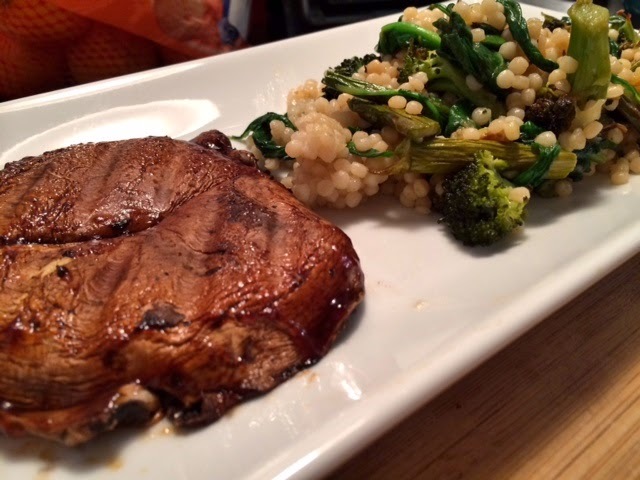 I provided a recipe link for the portobello steaks in last week's Six Week Grind post. When I was preparing to cook them, I took a left turn and opted for a different option. For the pearled couscous salad, I varied the veggies and the preparation just slightly. I like my asparagus and broccoli roasted. Recipes below. It's Day 20 of the 30 Days of Food Challenge!! Excited to keep cooking and to get through the challenge. I'm also working on a new challenge. Stay tuned for the details. Happy Monday! Whisk together olive oil, garlic, vinegar, salt and pepper in a bowl until olive oil and vinegar are no longer separated. Place mushroom caps in a shallow dish and pour marinade over the caps. Allow them to sit for an hour. After an hour, shake off excess marinade and place mushroom on a hot grill (I used a Foreman Grill). Cook for about 2-3 minutes on each side. Remove from grill and brush the top of the mushrooms with a bit of marinade if desired. Place broccoli and asparagus on a baking sheet. Sprinkle olive oil and coarse sea salt over vegetables and roast at 425 F/220 C for about 20 minutes. Bring salted water to a boil. Cook the couscous as you would pasta until it is al dente. Strain, set aside, and toss with a light layer of olive oil so the pearled couscous does not stick together. Heat a skillet on medium heat and add a tablespoon of olive oil. Saute zucchini for about 3-5 minutes. Add spinach and arugula in the same pan and season with salt and pepper. Remove from heat, mix couscous and vegetables together and serve.